VEXIS Voice - Q3-2010 | VEXIS Systems, Inc.
VEXIS Customer Portal - Your Gateway to Service! To Do List: This Budget Season Remember Self Service! Context is a new theme brewing in the Contact Center arena. To be more clear, I'm talking about how to derive the intent of the caller based on customer information and previous interactions, and tailor the flow of the IVR to complete tasks more efficiently. What a concept! In my previous article I discussed the outdated IVR solutions that are rampant today and the effect these solutions have on the customer experience. Well, it seems that two of the industry’s leading platform manufacturers agree as well. 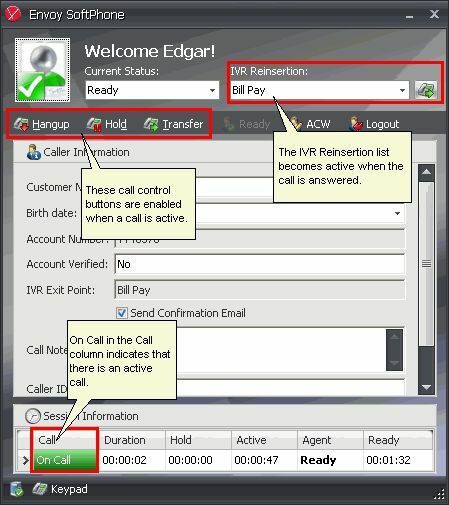 Both Convergys and Genesys have begun moving from concept to product with data interpretation tools designed to bring intelligent rules engine functions to the contact center with a particular focus on the IVR. Though they are coming to the solution from different viewpoints (see below) we at VEXIS see an incredible opportunity for our customers to leverage features of both product suites, along with our expertise, to create a truly world class contact center that is uniquely designed to provide the most dynamic customer experience across not only self service channels but also live agent interactions. The Dynamic Decisioning Solution (DDS) from Convergys is truly a state of the art decisioning engine that leverages their experience in delivering real time dynamic content to over 60,000 live agents worldwide across every major industry. The collection and analysis of caller behaviors across such a wide range of industries has provided Convergys the foundation for one of the most comprehensive decisioning engines we have seen. VEXIS’ extensive experience with data integration and aggregation as well as our Envoy server middleware can help to quickly deploy the DDS solution so that our Customers can begin realizing the benefits of the decisioning tool with their current technology infrastructure. Genesys is working to bring similar functionality to its product suite via the Intelligent Customer Front Door (iCFD). By leveraging the extensibility of the Genesys framework (CTI, Routing, Workforce Management, and their Voice Portal) they first introduced iCFD as a concept for application development but are now looking to add tools to their Composer development studio to allow the creation of Context Management which would provide greater integration with not just the contact center but also the enterprise. This is something that VEXIS has been building and creating for our customers for several years and we are excited to see our Manufacturer partners taking notice and driving these initiatives into their products. As you can see, when these solutions are combined with a VXML enabled IVR platform and VEXIS’ years of knowledge and experience in creating dynamic solutions with our Data Driven Design™ principles and Envoy middleware, it will be you our customers who are the real winners. Leveraging the technologies and application solutions to deliver your callers a more meaningful interaction with your organization, be it self service or live agents you can achieve a higher level of customer satisfaction which should resonate in the bottom line. If you would like to learn more about VEXIS and how we are working to bring you solutions utilizing the latest technological advancements, please check out the rest of this newsletter. To find out more about these emerging technologies and to discuss how these solutions can begin adding value to your customer interactions please contact your Regional Territory Manager or you can contact our inside sales team either by e-mail (sales@vexis.com) or by calling 918-663-8080. Soon it will be time to protect your IVR investment by renewing your existing Platform Support coverage with VEXIS Systems. Your software support contract with VEXIS Systems ensures that you have access to our highly-skilled, specialized Support Analysts and Developers, as well as assistance from the software manufacturer including access to software patch releases and new releases of VEXIS-provided IVR, CTI, and reporting platforms. Please make sure that your critical systems are continually protected by keeping your support contract up to date. The consequences of an outage to your mission critical contact center systems can have a huge financial impact to your company, overload human resources (CSRs), as well as decreased customer satisfaction. We suggest that the platform support coverage of your contact center platforms (IVR, CTI, etc) be considered a necessity for you and your customers. In addition to platform support, you can ensure you have application support via a VEXIS Extended Application Warranty. Under an Extended Application Warranty, you receive support for applications written by VEXIS or that have been reviewed and approved by VEXIS. Troubleshooting and correcting application bugs and discrepancies between the design documentation and the application functionality are included as part of the warranty. Additionally, as you may recall the VEXIS Extended Application Warranty coverage was significantly enhanced for 2010 and includes additional key benefits. For more information about this coverage or to ensure that your applications are protected, you may contact Julie Morrell, VEXIS Account Consultant, at 918-280-4058. We have many great resources available to you at VEXIS Systems and are working to add new features and tools in order to provide more value for your dollars plus allow your employees to be more efficient and effective. Please let one of our Support Analysts know of any requests or comments that you might have. We want to continue to provide you with the exceptional interactions and effective service resolutions you have come to expect from VEXIS. As always, we appreciate your business and look forward to helping you address any needs you may have in the last half of 2010 and continuing as your 2011 premier contact center solutions partner. Be on the watch for additional maintenance renewal information over the next several weeks. Did you know that you can review your VEXIS Systems support tickets 24 hours a day, 7 days a week on the VEXIS Customer Web Portal? As an added value to our customers, this web portal gives you the ability to access a number of tools for viewing ticket history, interacting with the support team, and obtaining service. You can access the VEXIS Systems Customer Support Portal at www.vexis.com/trouble-tickets. Be advised that you will need a user ID and password in order to access this new system. If you do not yet have a user ID for the portal, please contact the VEXIS Technical Support team at support@vexis.com or by calling 918-663-8080 and toll free 888-58-VEXIS. In the previous two “Envoy Updates” articles - Building a “Better” Soft Phone, Part One and Building a “Better” Soft Phone, Part Two – the technical feature set of the Envoy Soft Phone (ESP) was listed and explained. Before continuing in the technical arena, in this third article, let’s instead take a look at some of the features of the user interface; after all a picture is worth a thousand words. I wanted to show the completely customizable nature of the user interface which includes skinning, resizable windows, configurable user controls, and complete “memory” (window size, screen position) of how the application was last presented. 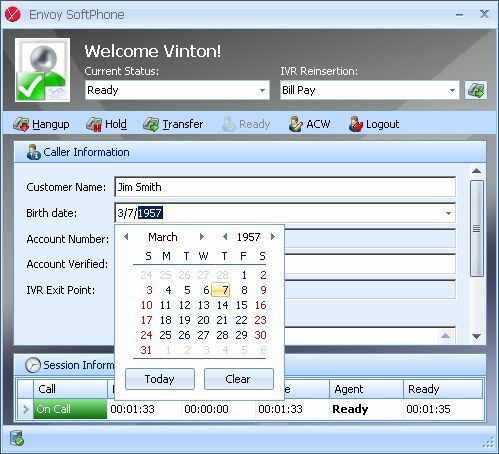 Dynamic Call Data Display – ESP with a different “skin” (look and feel) and the window has been sized smaller. 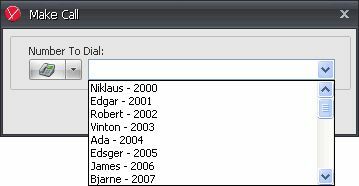 Note the call data fields are not the same as the above screen shot; all call data fields are dynamic in nature so fields can be added or removed without any programming changes required to the ESP application. Data Type Aware Data Fields – ESP with a call data field being edited - the “data type aware” capabilities of the call data fields causes a calendar to be displayed when editing occurs on this field because the field is a date. The popup data editor approach is not only intuitive to the user, but also can ensure proper input of data (i.e. an invalid date entry cannot be inserted). Having data limits and constraints on user input controls on the front end can drastically reduce the possibility of invalid data entry so the data in your backend systems is more accurate and reliable. Data constraints can be assigned to any call data field; a different editor can be displayed for different field data types. 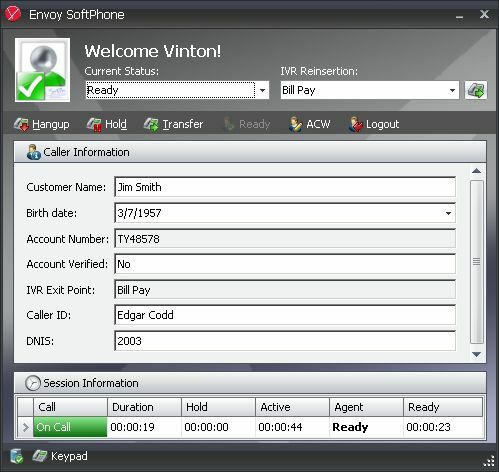 Call Control / Session Information – The user interface of ESP is informative yet uncomplicated. All the call control buttons are grouped together on a tool bar. One location dedicated to “Session Information” gives the user a view of the current call state, agent state, and all important timers. A single location is used to set the agent mode as well as AUX codes. AUX code, agent mode, and logout codes can all be centrally configured to have custom labels on per agent or agent group level. An optional IVR reinsertion list is available to make more efficient use of agent time and lower the average talk time which equates to real dollar savings. Friendly User Controls – All controls that get displayed are intuitive; the concept of “least number of clicks” was a big part of every design consideration as well. 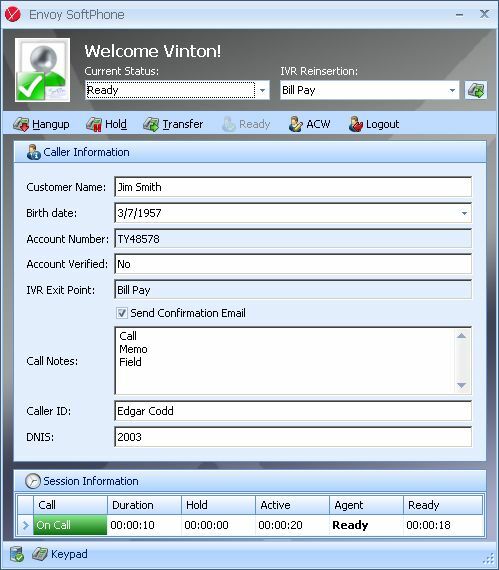 Speed dial lists (personal, group, and global) can be centrally managed and are shown when the agent needs to dial to allow one click access to numbers in order to save keystrokes. 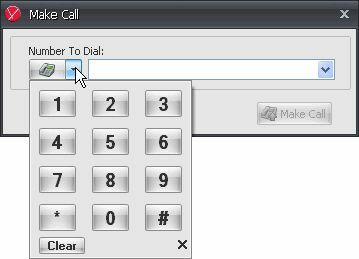 For instance, the “Make Call” control allows the numeric keypad from the keyboard to be used or it can be manipulated with the mouse - using the speed dial list or an interactive DTMF keypad. We will continue to explore the features and functionality of ESP in the next VEXIS Voice “Envoy Updates” article. Hang on to your seats for Part 4 of this article! We know during the 3rd quarter our customers finalize budgets for the coming year and now more than ever it is important to make sure you have included your IVR and CTI solutions in your 2011 budgeting process. Remember it's important to make sure you schedule time to meet with your VEXIS Account Team. Now is the time to take a second look at those dusty IVR applications, many that were written five (5) or more years ago and have only been lightly touched up, if they have been reviewed at all. These applications often have been developed in a legacy IVR development tool and are not capable of taking advantage of newer more efficient development methodologies. As technology has changed many solutions and applications that were either unavailable or too costly to implement, even just a few years ago, now have the potential to provide additional ROI and benefits to your IVR investment. The VEXIS Data Driven Design™ is an excellent place to start. As your industry experts, VEXIS is constantly evaluating new products and technologies to help provide more objective and "real world" insight to our customers. We have attended key manufacturer user's groups and industry conferences to learn more about the latest updates on various product roadmaps. If you have questions, or would like to schedule some time to talk about emerging technologies and the options you have to convert your existing legacy IVR application(s) to the new industry standards, we are here to help. This newsletter is designed to provide you with useful support, technical and key topics of interest to you in a fast and efficient manner. Let us know what you’re interested in seeing future issues. The goal is to make the results you get reading this as worthwhile as possible for your time.